Infertility is becoming an increasing factor affecting women world-wide. Studies have found a direct link behind obesity and infertility due to the high occurrence of insulin-sensitive pituitary receptors/cells becoming engulfed with high insulin levels during obesity. The pituitary glands in females are responsible for releasing luteinizing hormone and gonadotropin-releasing hormones. These two hormones are essential for normal fertilization and ovulation. When the pituitary gland is however overstimulated due to high insulin levels, infertility occurs due to an irregularity in luteinizing and gonadotropin-releasing hormone levels. It has also been found that that not only the pituitary gland but also gonadotrophs contain insulin receptors/cells which if engulfed with high insulin levels such as during obese states can affect normal fertility levels. This then puts obese individuals at an even more disadvantaged position as both the pituitary and gonadrophins contain insulin receptors or cells which if engulfed in high levels of insulin double the chance of in infertility. Has this ever happened to you? You reach for a banana your bought a couple of days ago only to find it all brown and blotchy, kind of like it was in a fight with the oranges or plums that were placed around it in the fruit bowl and ended up coming out worse for wear! Before throwing it in the bin, think twice, are brown sports and mottled patches on your banana an indication that it has gone bad? Certainly Not…. 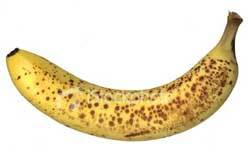 Any brown patches or browning of a banana is in fact the ripening process which helps sweeten the fruit, apparently the browner or patchier the banana, the more sweet it is with a completely unripe banana progressing from zero sweetness to around 80% sweet as it undergoes the ripening process (do take note of this factor if you are diabetic). What’s more is that bananas are an excellent source of vitamin C, vitamin B6, Potassium, dietary fiber (helping keep you regular) and manganese. They have also been found to help regulate blood pressure levels due to their high content of potassium thereby also helping reduce the risk of a stroke. And for those “bad mood” days where you feel like you’re about to explode (an depressive tendencies), try eating a banana as vitamin B6 together with the amino acid tryptophan found in bananas helps change body chemicals such as serotonin and norepinephrine. For stomach ulcers, again, eat a banana as they help the stomach to produce protective mucus and protease inhibitors thereby helping keep the stomach safe from strong stomach acids. For an upset tummy with diarrhea and a large loss of essential electrolytes, chomp a banana as they are high in electrolytes and also contain essential probiotics thereby helping ensure good bacteria remains in the body whilst the growth of bad bacteria is kept under control. Two of the most important features of what appears to be a severely battered banana are its antioxidant level and TNF… when fully ripened, bananas have huge antioxidant levels and contains TNF. TNF was found by Japanese Scientific Research. Bananas with dark spots or patches produce Tumor Necrosis Factor or TNF which according to studies has the ability to fight abnormal cells thereby improving immunity and white blood cell capability. As a result, it has been said by this research that ripe bananas are ideal in the fight against cancer. Well that’s me for bananas… I’m off to go buy some “battered bananas” to have for lunch… and if I can’t find any, I may just be tempted to batter a few myself. Under normal circumstances, glands in the nose and the throat routinely produce one to two quarts of mucus per day. This mucus functions to moisten and clean the nasal membranes, humidifies air and traps and clears inhaled foreign particles. It is however excess mucus that can pose a problem as it can accumulate and cause a backward flow of mucus down the throat. Pregnant women are more susceptible to developing post nasal drip as a result of hormone fluctuations and will usually experience an uncomfortable condition of severe nasal congestion and rhinitis which can occur anytime during pregnancy and can last for the entire pregnancy. 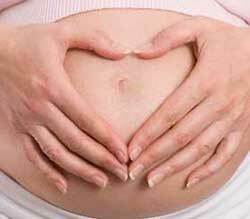 During the first trimester, women experience hormonal changes that can cause swelling of the linings of the nose. This can result in congestion that may lead to complete nasal obstruction in severe cases. The symptoms may differ from one pregnant woman to another. Some may experience sneezing, coughing, a runny nose (Rhinorrhea), facial pressure and headaches. Treatment of post nasal drip during pregnancy will depend on the severity of the above mentioned symptoms, as any use of medication for treatment during pregnancy should be well researched and where necessary, advised by a Physician. Alternatively, in order to reduce the swelling of the linings of the nose a saline nasal rinse can be performed using salt water to rinse the nose; this often helps pregnant women maintain open nasal airways. A steamy shower room can help relieve congestion as the expectant mother feels the effects of steam inhalation; just ensure the water is not hot as it can burn the skin and at times steam may cause shortness of breath. Sinus-Pro has a natural treatment for Post Nasal Drip during Pregnancy. I just heard of the term “molecular dinks”… ok, no judging, my social life I agree could be more crazy but anyway! Molecular mixology (the technical term), is all about mixing molecular drinks to create absolutely new taste experiences, textures and feels with visual aids to top it all off. Additives used can vary from gels to mists, heat to solidifying liquids and foams to liquid nitrogen. This is said to create a whole new cocktail experience when enjoying a night out; however can these drinks be bad for you in any way? Media has recently shown how molecular drinks that contain liquid nitrogen (often used in molecular misology) are extremely dangerous. Liquid Nitrogen is used in molecular drinks to give what is termed the dry ice-effect and is said to give a bit more excitement to every day cocktails people have drunken millions of times in the past. This effect has however been achieved with the less-dangerous-to-handle substance carbon dioxide so why the extremes of liquid nitrogen. Nitrogen, even though not expensive to purchase is expensive to store as special canisters need to be sought to house the liquid and prevent it from exploding. 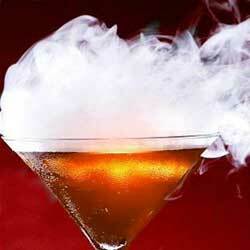 When liquid nitrogen is used to chill the glass of a cocktail or garnish, it immediately starts to evaporate, engulfing the cocktail in a “Pennsylvania/Dracula” type mist however it is warned, you cannot drink the cocktail until all the mist has subsided. Also drinking it in its liquid form before the gas has begun is fatal as the liquid becomes a gas and expands in an individual’s stomach causing it to explode. Then there’s the rule that liquid nitrogen should not be put in the cocktail itself. One can identify if the liquid nitrogen is in the cocktail as it floats or rolls on top of the drink. A recent incident occurred in the UK with a teenager drinking a liquid nitrogen drink and in the end, ending up with her stomach being removed; this has sparked parliament in the UK to request a ban on liquid nitrogen used in molecular drinks. According to reports, liquid nitrogen does the same as ice, just millions of times worse; if you put an ice cube straight from the fridge onto your moist tongue, the ice cube will stick, same principle with liquid nitrogen except its sticking power is infinitely worse and if ingested in liquid from will expand ten-fold and more when in the stomach. 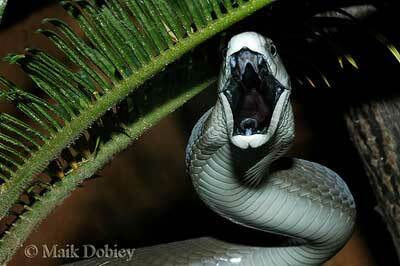 Seriously Considering getting a Black Mamba as a Pet… Not! As beautiful and regal as these creature look the idea of me getting a snake is totally insane, especially considering I am petrified of the sleek and slithery creatures… Ok, now that that’s said, if I wasn’t absolutely shock-scared of them, I may just consider getting a Black Mamba as a pet; but not for its shear grace and sleekness, rather for its medicinal benefits. The Black Mamba is in fact considered to be one of the most deadliest snakes living mostly in Africa and are among the fastest snakes around… better get on that treadmill before I plan a trip to Africa… and have a famously black tongue, hence their name. Their venom is both cardio-toxic and neurotoxic so quite a deadly combination. Black Mamba venom has been found to be an ideal painkiller without any side effects that one mostly experiences with other opiates (pain killers). Conventional painkillers can usually result in muscle twitching, a foggy mind, shallow and slow breathing and increased tolerance however Black Mamba venom, when used as a pain killer doesn’t cause any of these side effects. Researches call the protein found in the venom which helps with pain, “mambalgins”. The sleek Mamba is however not the first snake to show the benefits animal venom has on pain with the venom of the cone snail being used in ziconotide, a product currently on the market. Venom from other animals such as scorpions, spiders and sea anemones have also been found to assist in the treatment of multiple sclerosis, cardiovascular illnesses and even diabetes. All this said, if you’re like me and want to try a non-toxically derived natural pain-reliever that won’t leave you with unwanted side effects, you can try Sinus-Pro’s Sinus Headache Remedy. This Remedy contains an array of Homeopathic and Natural ingredients targeting headaches that increase in intensity, cause overall facial pains and even facial swelling; and means I don’t need to resort to snake-keeping-ways to avoid side-effects. Sorry Black Mamba, as beneficial as you are I can’t see us having a love relationship. In treating Nasal Polyps, Thuja has been found to be characterized with treating anything produced in excess or overproduced such as excessive and unnecessary fluid building up in the nasal polyps. It has also been found to assist in treating thick, green and offensive discharge together with nasal bleeding, a loss of smell, ulceration and pain/pressure in the nose. 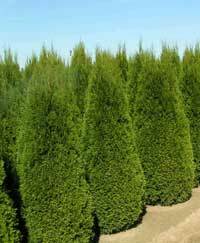 Thuja is also ideal in treating excessive overgrowth of tissue. I have also heard the Thuja tree being referred to as the tree of death, so it is both the tree of life and death (a full-circle tree) and is often planted in graveyards as it is associated with immortality. I personal like to call this tree the tree of life and when referring to its effect on Nasal Polyps, the tree that brings death to these persistent growths. Sinus-Pro has been investigating nasal polyps extensively. The Sinus-Pro team is determined to prove that homeopathy can affect the expression of the Fas-L protein. Research has been done to illustrate the role of a specific protein in the development of nasal polyps. This research was done by the Department of Otolarnygology, Faculty of Medicine, National Cheng Kung University, Taiwan. The protein investigated is known as Fas-L gene protein. The study investigated the transcripts and protein level of the Fas-L gene in human nasal polyp tissue as well as nasal turbinate mucosa. The investigation used methods such as reverse transcription-polymerase chain reaction and Western blotting. The localization of Fas-L was performed with immunohistochemistry. The result of this research showed that the transcripts of Fas-L gene were detected at similar levels in both polyps and nasal mucosa. However, there was a recorded over expression of the Fas-L protein on nasal polyps as compared to nasal mucosa. There existed localization of Fas-L positive cells on the epithelial layers of cystically dilated glands and the down-growing epithelium of nasal polyps. As a result it was concluded that Fas-L may play a vital role in the pathogenesis of human nasal polyps. This role includes cystic degeneration of submucosal glands. It has been disputed that natural or homeopathic products can have any effect on the expression of Fas-L protein. However, there has been research done to prove that natural products work to alter the expression of the Fas-L protein. One such study uses Solanum lyratum extract and the effect it has on apoptosis (a form of cell death) and the expression of Fas/Fas-L genes. This study comes from the Department of Biochemistry and Molecular Biology, Youjiang Medical College for Nationalities, China. The research showed that this natural substance decreases the expression of the Fas-L protein markedly. It is therefore the Sinus-Pro’s team belief that we have just touched the surface of what complementary medicine can do. It is their mission to continue researching and prove that the homeopathic ingredients that make up Sinus-Pro Nasal Polyps Remedy work at targeting and reducing the expression of the Fas-L protein in the nasal mucosa.